The most exciting game of round 12 in the LPB took place in Colon. This derby game ended with only two-point defeat on the road of 3rd ranked Caballos (6-6) to second ranked Correcaminos (9-3) 78-76 on Saturday evening. It ended at the same time the four-game winning streak of Caballos. Correcaminos made 16-of-20 free shots (80.0 percent) during the game. The best player for the winners was American forward Terrence Shannon (203-79, college: Elgin CC) who had a double-double by scoring 19 points and 12 rebounds. The former international point guard Trevor Gaskins (188-89, college: Louisiana Tech, agency: Pro Sports) chipped in 15 points and 8 assists. At the other side the best for losing team was Puerto Rican point guard Alvin Cruz (186-82, college: Niagara) who recorded 20 points, 8 rebounds and 8 assists. Defending champion keeps a position of league leader, which they share with Universitarios. Caballos at the other side keep the third place with six games lost. They share the position with Panteras. Correcaminos is looking forward to face Panteras (#4) in Panama City in the next round. Caballos will play at home against Aguilas and it may be a tough game between close rivals. Another interesting game was a derby match between two teams from Panama City: Halcones (#1) and Aguilas (#4). Halcones (9-3) smashed visiting Aguilas (5-7) by 21 points 77-56. It was a good game for American center Christophe Massie (206-77, college: Memphis) who led his team to a victory with a double-double by scoring 11 points and 13 rebounds. Wil Martinez contributed with 20 points for the winners. 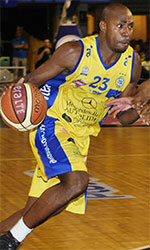 American center Travis Elliott (203-91, college: Beth.-Cookman) replied with 6 points and 21 rebounds for Aguilas. The winner was already known earlier in the game, so both coaches allowed to play the bench players saving starting five for next games. Halcones maintains first position with 9-3 record, which they share with Correcaminos. Aguilas at the other side dropped to the fifth place with seven games lost. Halcones will play against bottom-ranked Toros (#6) in David in the next round where they are favorite. Aguilas will play on the road against Caballos in Aguadulce and it may be a tough game between close rivals. The game with biggest result difference took place in Panama City. Local Panteras (6-6) outscored 6th ranked Toros (1-11) 84-53 on Sunday night. Worth to mention a quality performance of Jorge Matos who helped to win the game recording 23 points, 6 rebounds and 5 assists (went 7 for 7 at the free throw line). The best for the losing side was James Scott with 13 points and 6 rebounds. Since the result was very predictable, it gave the chance for the coaches to test many bench players which allowed the starters a little rest for the next games. Panteras moved-up to third place, which they share with Caballos. Loser Toros stay at the bottom position with 11 games lost. Panteras will meet at home league's second-placed Correcaminos in the next round and it will be for sure the game of the week. Toros will play against the league's leader Halcones (#1) and hope to win that game. Another interesting game was a derby match between two teams from Panama City: Halcones (#1) and Aguilas (#4). Halcones (9-3) smashed visiting Aguilas (5-7) by 21 points 77-56. Halcones forced 21 Aguilas turnovers. Strangely Aguilas outrebounded Halcones 55-38 including a 23-9 advantage in offensive rebounds. It was a good game for American center Christophe Massie (206-77, college: Memphis) who led his team to a victory with a double-double by scoring 11 points and 13 rebounds. 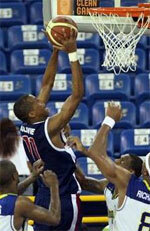 American-Puerto Rican Wil Martinez (188-92, college: Fairmont St.) contributed with 20 points for the winners. Four Halcones players scored in double figures. American center Travis Elliott (203-91, college: Beth.-Cookman) replied with 6 points and 21 rebounds and his fellow American import swingman Lovell Cook (201-90, college: New Orleans) added 19 points and 5 rebounds in the effort for Aguilas. The winner was already known earlier in the game, so both coaches allowed to play the bench players saving starting five for next games. Halcones maintains first position with 9-3 record, which they share with Correcaminos. Aguilas at the other side dropped to the fifth place with seven games lost. Halcones will play against bottom-ranked Toros (#6) in David in the next round where they are favorite. Aguilas will play on the road against Caballos in Aguadulce and it may be a tough game between close rivals. The most exciting game of round 12 in the LPB took place in Colon. This derby game ended with only two-point defeat on the road of 3rd ranked Caballos (6-6) to second ranked Correcaminos (9-3) 78-76 on Saturday evening. It ended at the same time the four-game winning streak of Caballos. Correcaminos made 16-of-20 free shots (80.0 percent) during the game. The best player for the winners was American forward Terrence Shannon (203-79, college: Elgin CC) who had a double-double by scoring 19 points and 12 rebounds. The former international point guard Trevor Gaskins (188-89, college: Louisiana Tech, agency: Pro Sports) chipped in 15 points and 8 assists. At the other side the best for losing team was Puerto Rican point guard Alvin Cruz (186-82, college: Niagara) who recorded 20 points, 8 rebounds and 8 assists and naturalized American point guard CJ Rodriguez (188-94, college: S.Nazarene) added 18 points, 5 rebounds and 7 assists respectively. Both teams had five players each who scored in double figures. Defending champion keeps a position of league leader, which they share with Universitarios. Caballos at the other side keep the third place with six games lost. They share the position with Panteras. Correcaminos is looking forward to face Panteras (#4) in Panama City in the next round. Caballos will play at home against Aguilas and it may be a tough game between close rivals. The game with biggest result difference took place in Panama City. Local Panteras (6-6) outscored 6th ranked Toros (1-11) 84-53 on Sunday night. Panteras had a 34-23 advantage in offensive rebounds. They looked well-organized offensively handing out 21 assists. Worth to mention a quality performance of Puerto Rican guard Jorge Matos (185-92) who helped to win the game recording 23 points, 6 rebounds and 5 assists (went 7 for 7 at the free throw line) and Puerto Rican forward Benito Santiago (198-89, college: Cumberlands) who added 19 points and 4 assists during the contest. The best for the losing side was James Scott with 13 points and 6 rebounds and point guard Joel Munoz (183-80) scored 8 points, 5 rebounds and 6 assists. Since the result was very predictable, it gave the chance for the coaches to test many bench players which allowed the starters a little rest for the next games. Panteras moved-up to third place, which they share with Caballos. Loser Toros stay at the bottom position with 11 games lost. Panteras will meet at home league's second-placed Correcaminos in the next round and it will be for sure the game of the week. Toros will play against the league's leader Halcones (#1) and hope to win that game.